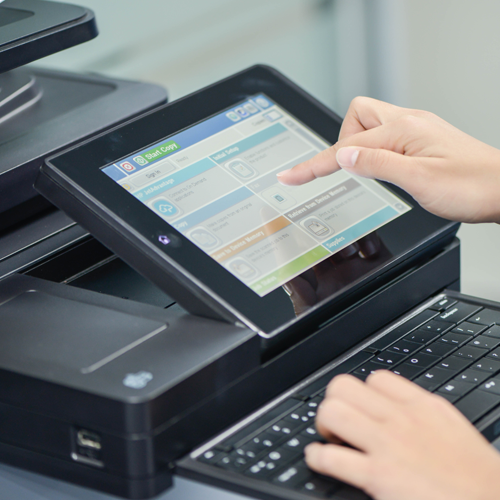 Managed Print Services (MPS) is a cost-saving program designed to streamline printer management, monitor printer usage, and eliminate wasteful printing behaviors. MPS will consolidate and reduce all the costs associated with your print environment–costs that can account for up to 3 percent of your total revenue. MPS programs minimize these costs by ensuring you have the right printing equipment in the right places, and by supplying your entire office with the quality technology and supplies that your business requires to function and succeed. Additionally, MPS includes monitoring of all printing equipment to determine where performance changes can be made. MPS will save your organization time and money because it allows your employees to focus on their top priorities, so no staff members are burdened with resolving printing issues or equipment errors. Instead, MPS shifts these responsibilities to our experienced professionals who perform these tasks on a daily basis. Additionally, all of your printing equipment will be proactively monitored, so our team can address and correct any issues that come up before they interfere with your operations. At its core, MPS brings simplicity, savings, and peace of mind to a print environment. An average of 17% of printed pages are considered waste. Reduce wasteful printing behaviors with MPS! Don’t trust your print fleet to just anyone. Your print infrastructure represents a valuable investment, so it’s important to work with an experienced print provider like DocuProducts that only employs highly trained analysts and technicians that are experts at managing and monitoring printing technologies. In addition to monitoring, managing, and servicing your entire print fleet, our MPS program also streamlines supply fulfillments so you always receive ink and toner on time, before you run out. And you never have an overstock of supplies lining office shelves. A single invoice simplifies billing procedures and ensures you can see all printing expenses in one place–making it easy to evaluate cost savings and budget for the future. Finally, our MPS program can also include security features designed to protect confidential data and secure all printed documents. At DocuProducts, MPS is more than a service. It’s a partnership you can count on. Contact us today to learn more. Most businesses spend 1-3% of annual revenue on printing expenses. It’s time to start saving with MPS!